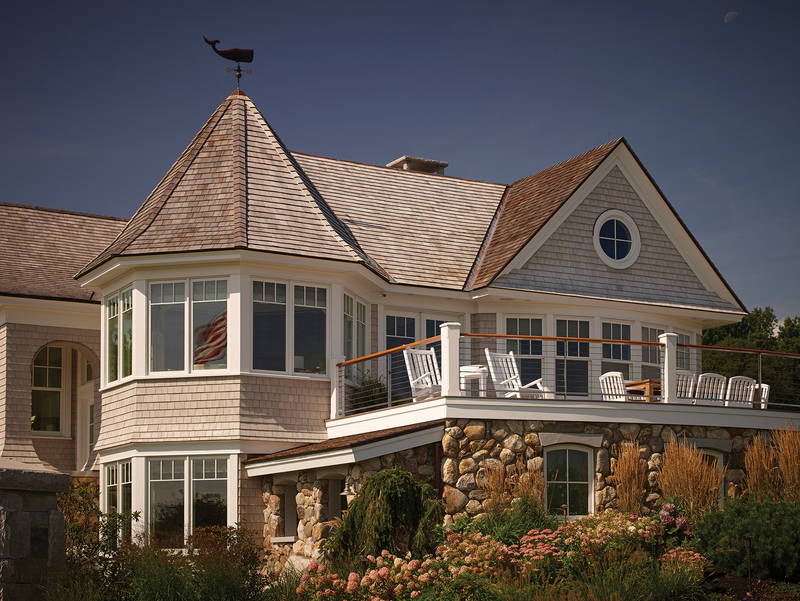 Set back from the sandy shores of a Cape Elizabeth beach, a sweeping stone driveway with mahogany gates gives way to a classic shingle-style home. 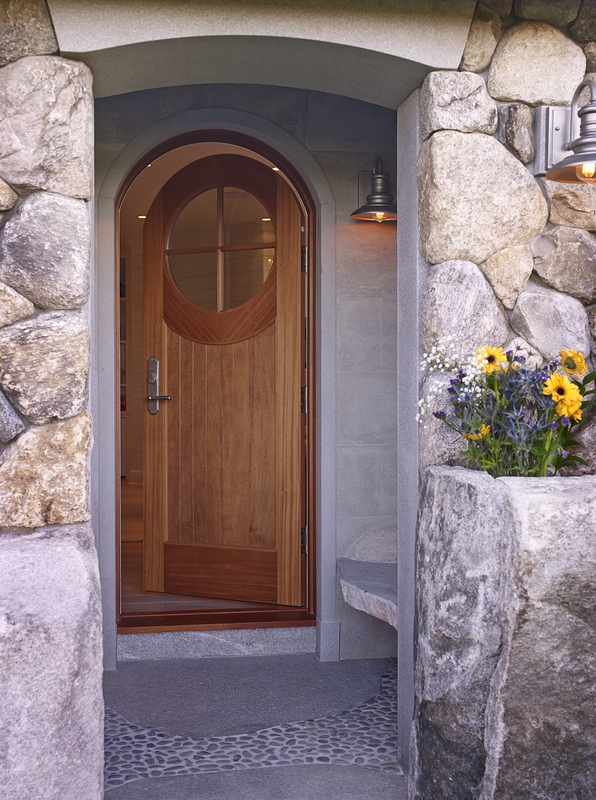 Surrounded by lushly landscaped gardens and characterized by sweeping roof lines, the house has been completely transformed from its original state as a split-story ranch. 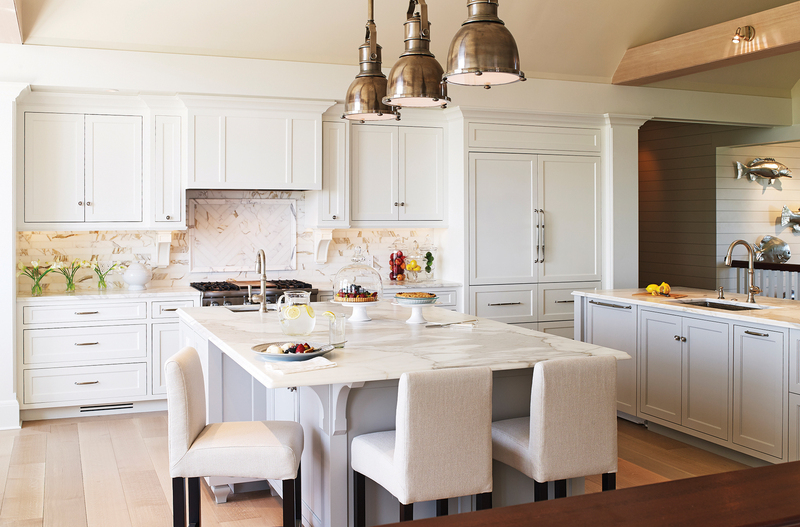 The kitchen is the heart of the home, and while it projects an easy and effortless quality, it was one of the most challenging aspects in the renovation. A new cathedral ceiling required intensive structural acrobatics due to the confines of the existing roof. 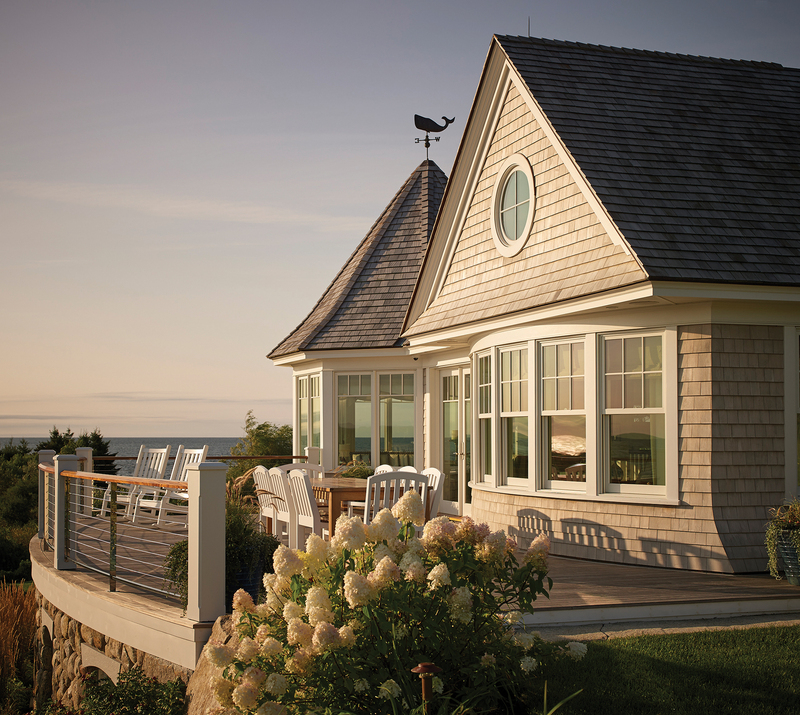 The result is an elegant and functional space that opens to the other living areas, and showcases breathtaking views to the ocean. 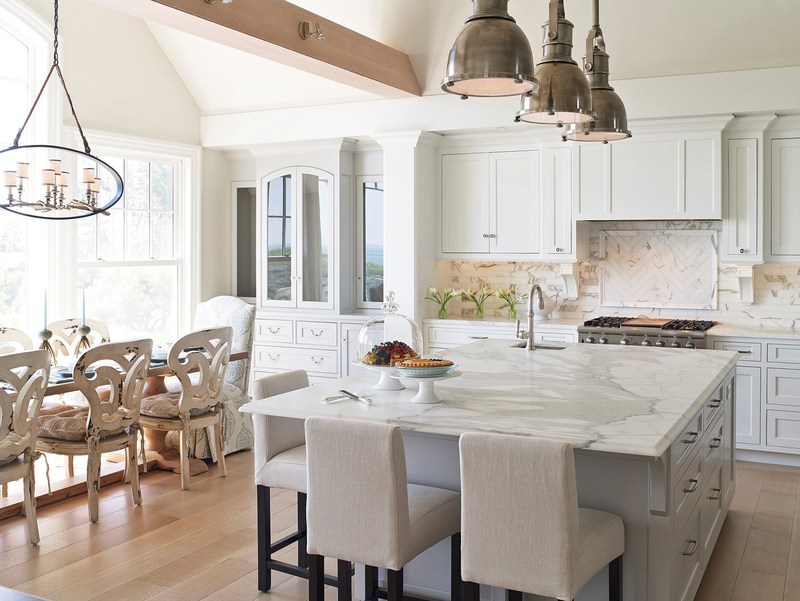 The layering of materials, such as the Calacatta marble, white-washed fir beams, nickel gap walls, and industrial pendants, gives the design classic sophistication with a touch of refined casualness. 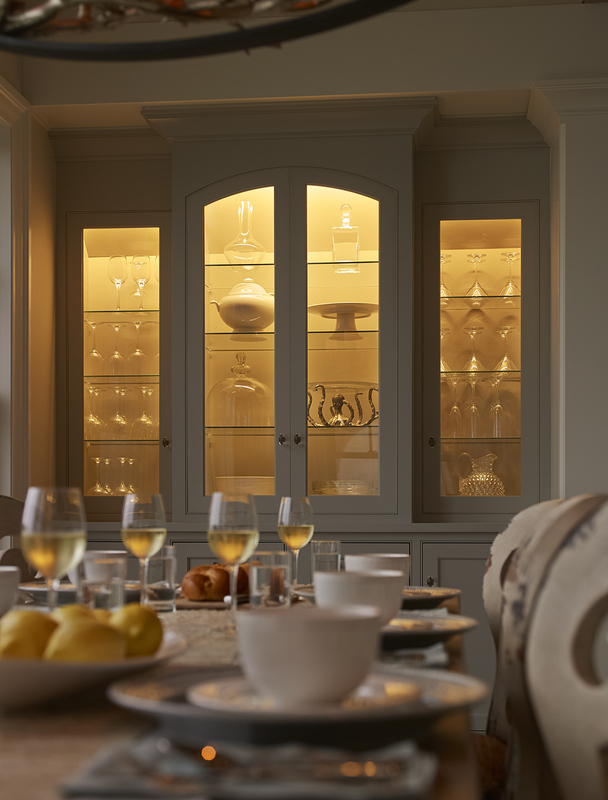 The living room and turret room, also known as “the ladies’ lounge”, sit adjacent to the kitchen on the main level. 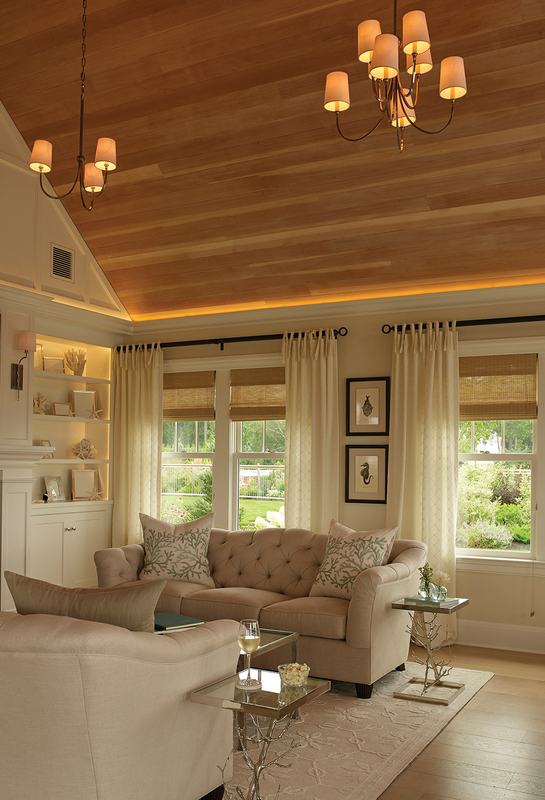 The ladies’ lounge, previously a formal dining area with a gold-leafed ceiling, is now filled with beautifully upholstered furniture, a stunning coral chandelier, and a white-washed fir ribbed ceiling. 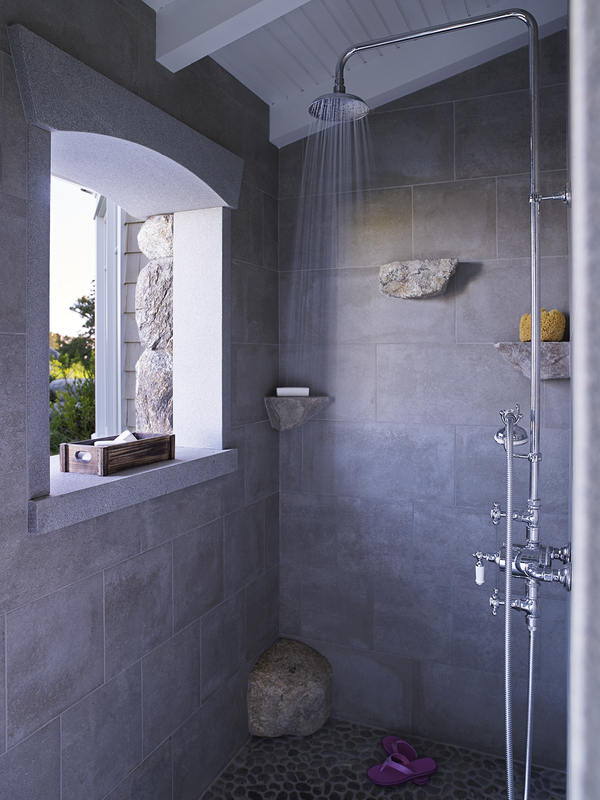 However, the star feature remains the bay of windows, which connects the space with the ocean’s rocky shore and brings in the fresh salt air. 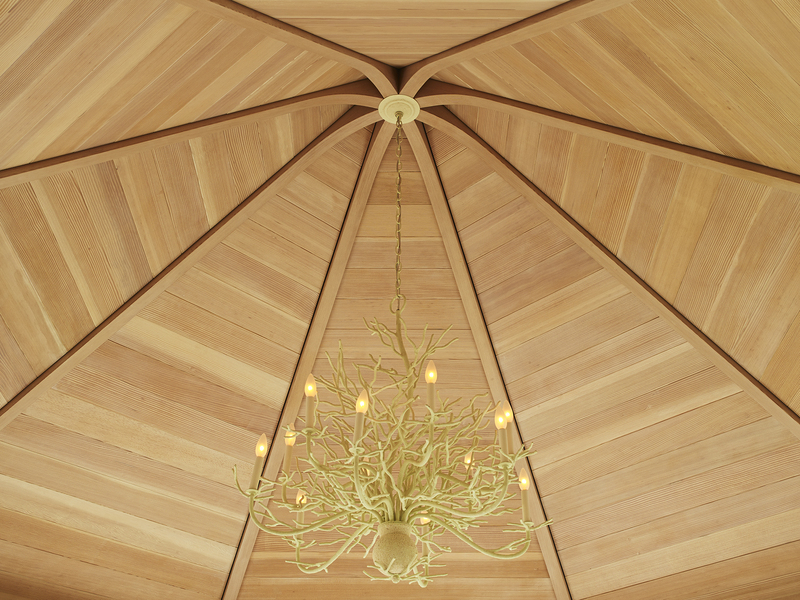 The white-washed fir continues into the living room in dramatic fashion, cladding the vaulted cathedral ceiling. 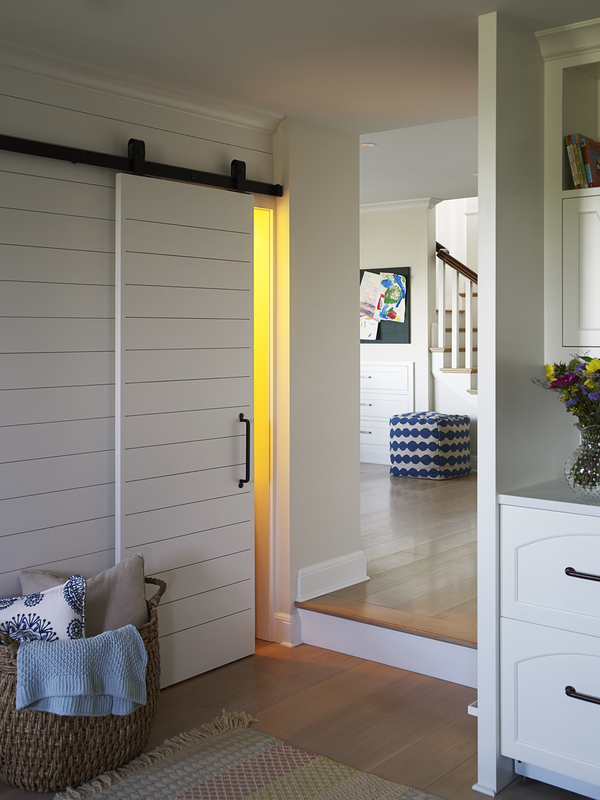 In renovating the home, the goal was to open up the interiors, add color and light, and create a more calming and relaxing ambience. 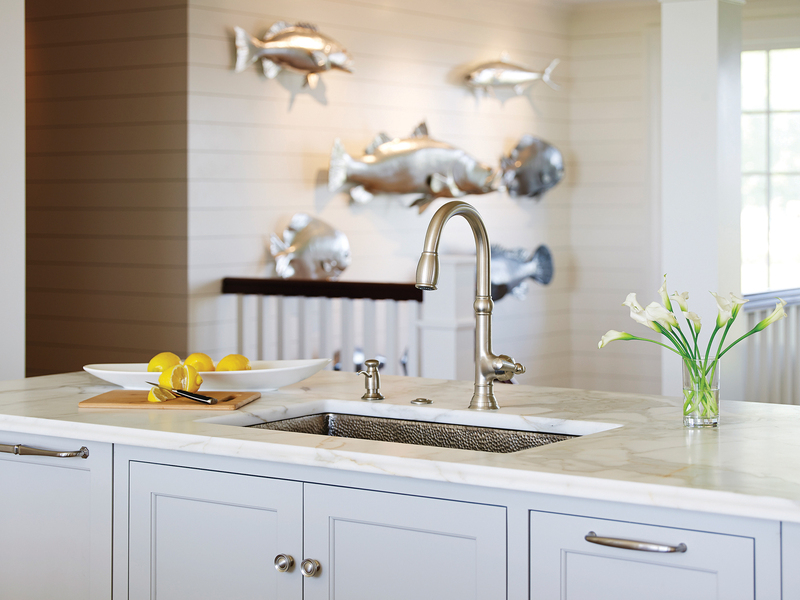 The emphasis is on soft whites, neutrals, and a subdued palette – the lightest of sea greens and ocean blues. 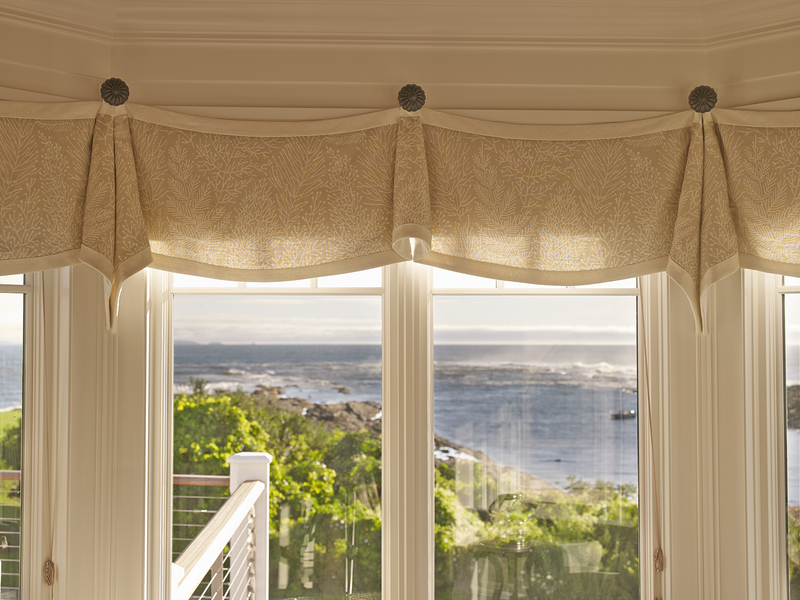 The perfectly framed view is elegantly flanked by custom window treatments. 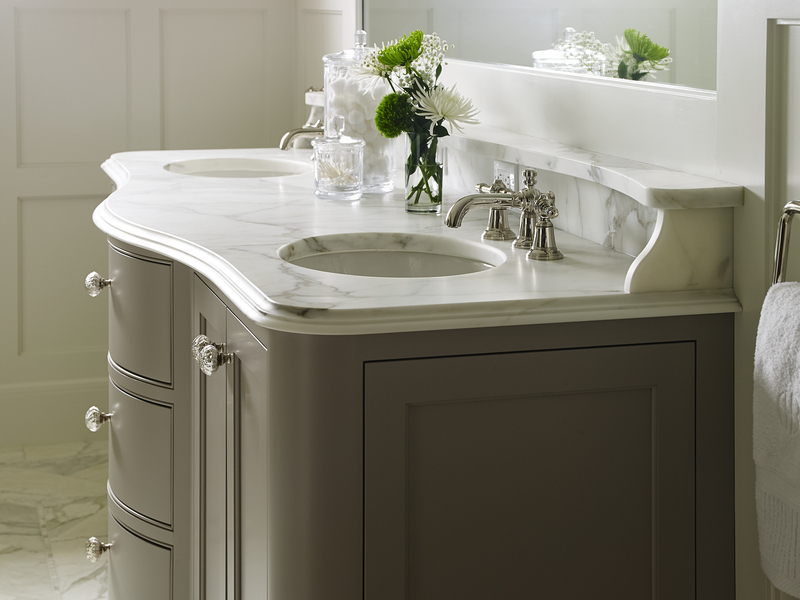 In the master bathroom, the classic design of the custom vanity is enhanced by curved drawers. 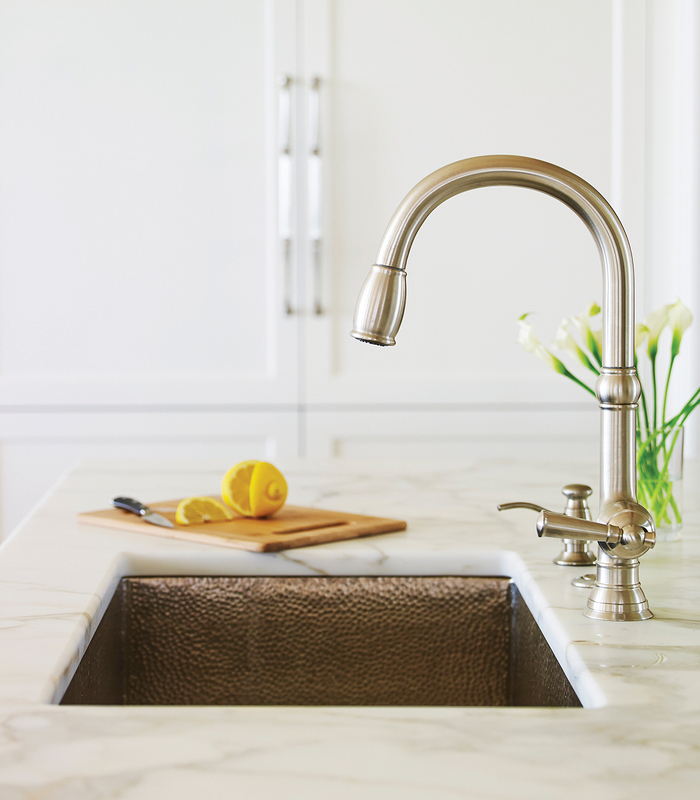 The sinuous elements were incorporated to soften and contrast with the geometric wainscoting on the walls. 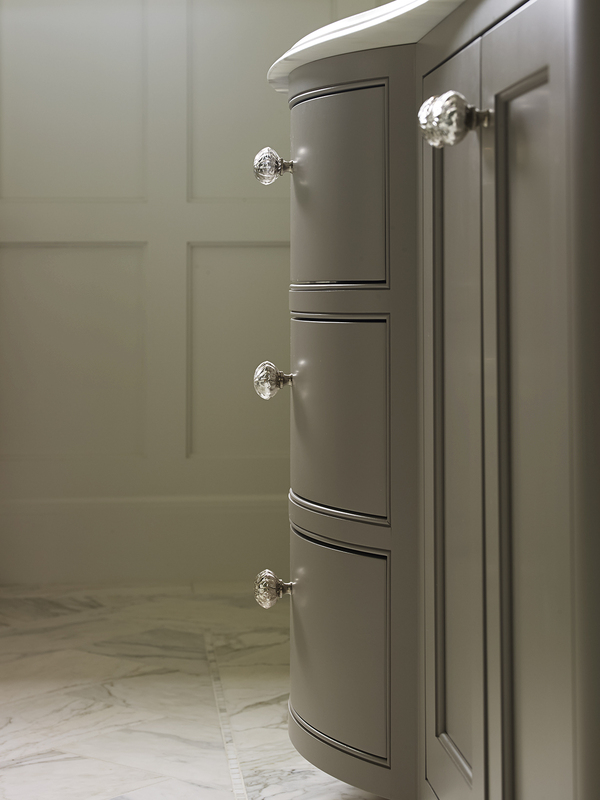 Mercury glass knobs stand out against the soft gray finish of the custom cabinetry piece. 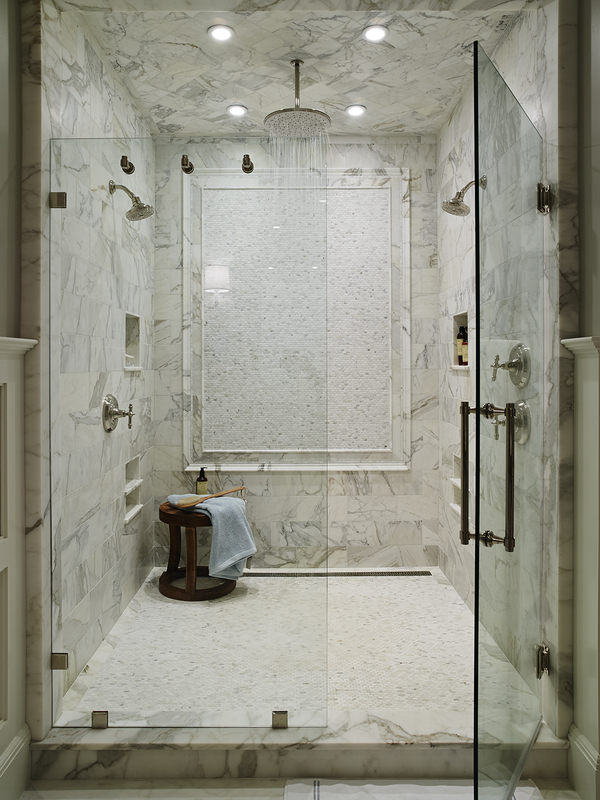 The vanity top is the same Calacatta marble seen in the kitchen; the marble is also used as tile, covering the bathroom floors and all surfaces of the walk-in shower. 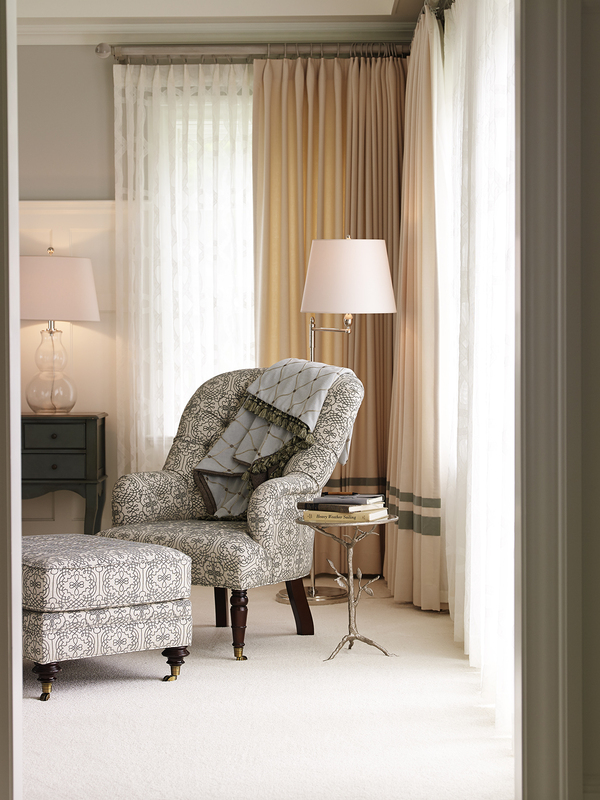 With a color palette similar to adjacent spaces, the master suite has a tactile softness in plush textiles that are both sensually appealing and encouraging of deep relaxation. 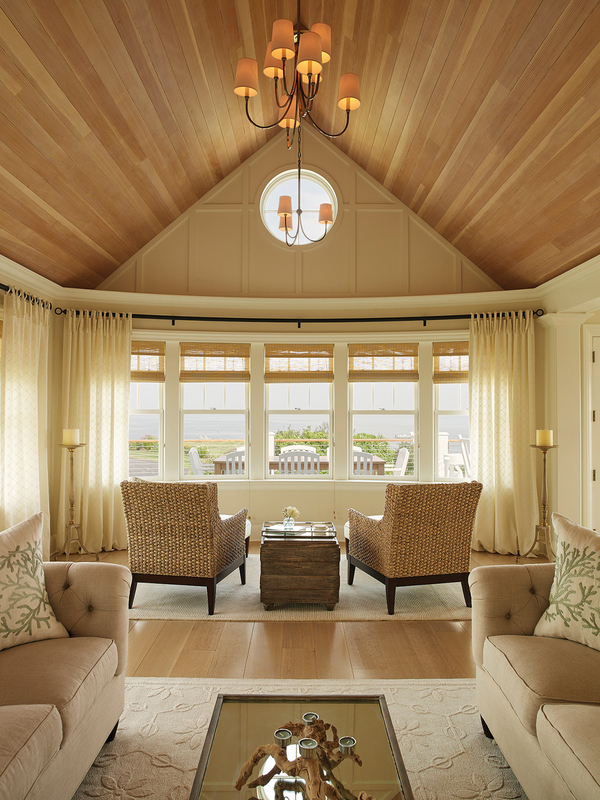 A dramatic coffer ceiling formalizes the distinct spaces in the room, and splashes of sea green add understated visual interest to the neutral backdrop. 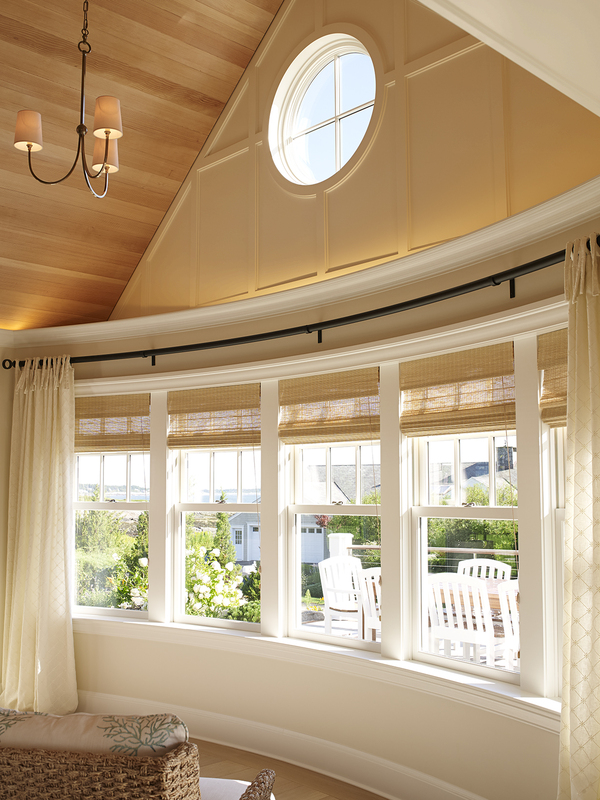 The window treatments, bedding, and upholstery are custom interior touches. 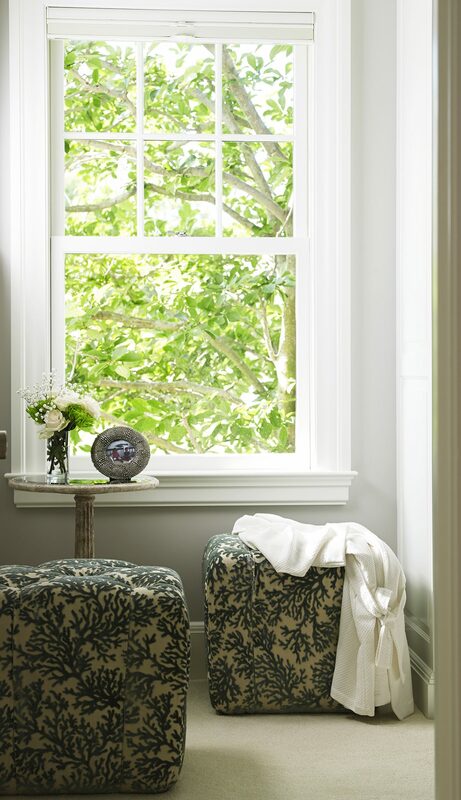 Embroidered window sheers provide privacy; the filtered light floods the space with a soothing unvarying glow. 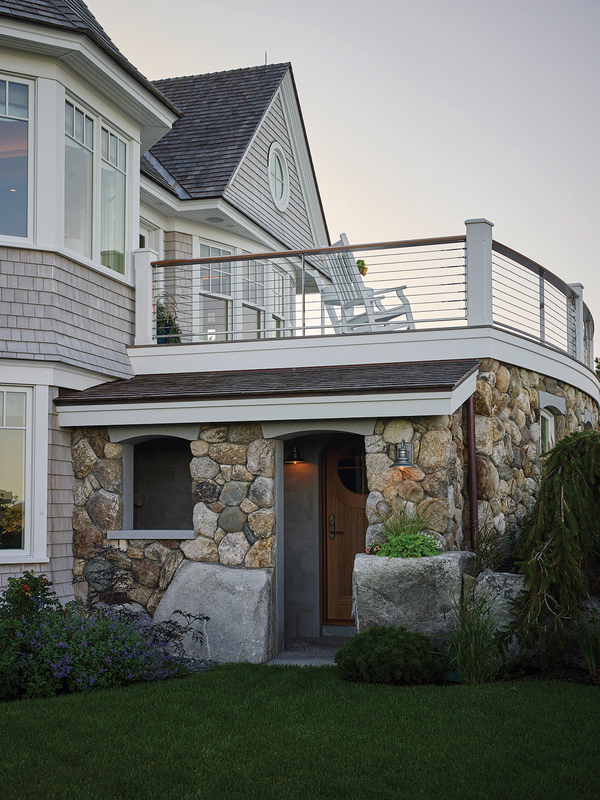 Between the open kitchen and the sunny passage to the backyard and pool, stairs lead to the lower “beach level” of the home. 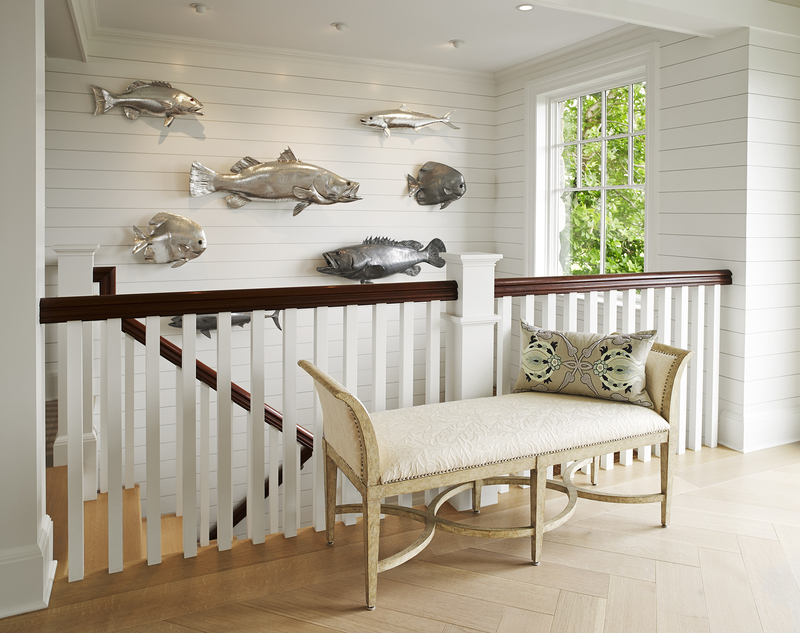 The striking arrangement of aluminum-sheathed fish – mackerel, yellowtail kingfish, cod, and Australian batfish – is in keeping with the sea-inspired theme and a subtle hint to the playfulness below. 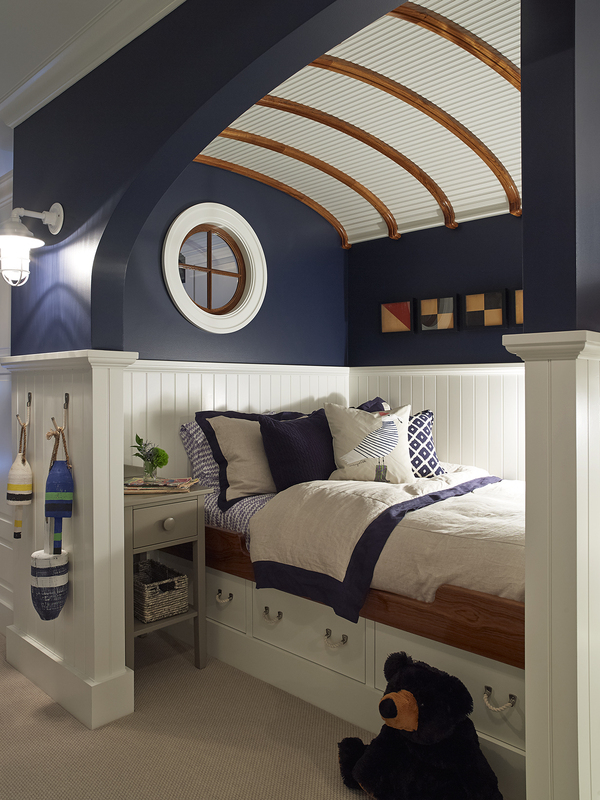 A hallway connects the sleeping quarters to the children’s art room. 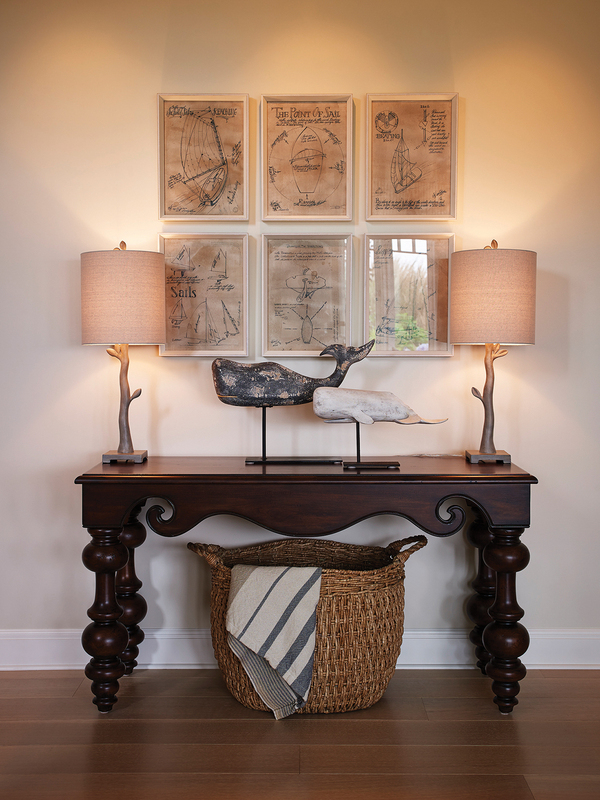 Playful touches are seen in the vintage sailing prints and carved wooden whales. 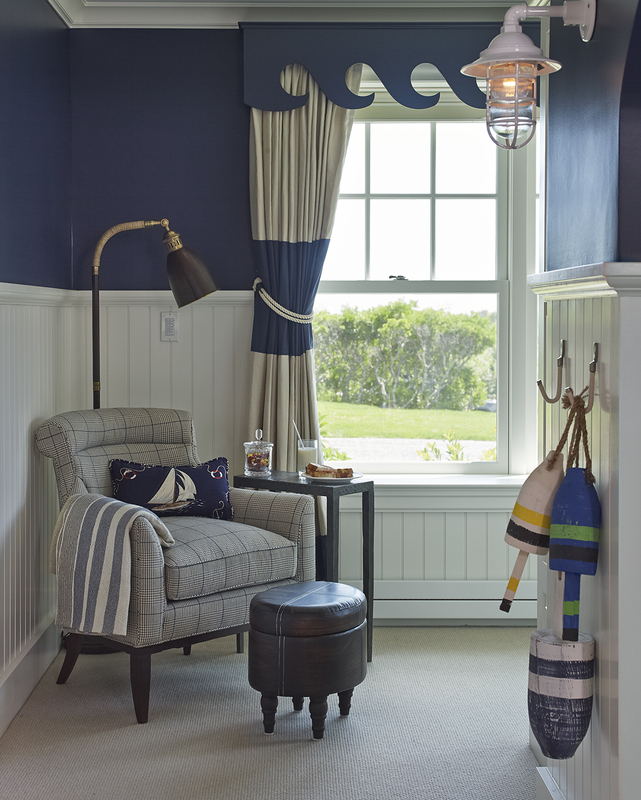 A dark cherry console mimics the motif of the ocean’s waves, and an oversized basket is the perfect catch-all for any loose items. Just next door, the girl’s room is pretty in pink. 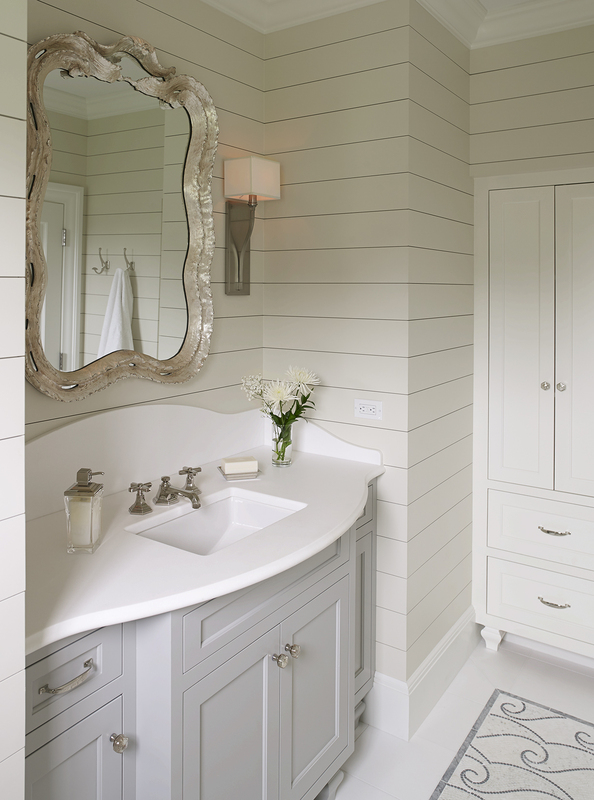 A dressing area with a wall mirror and ballet bar is perfectly accented by beautiful rock crystal sconces. The wood floor is designed in a unique herringbone pattern, adding to the space’s whimsical aesthetic. Across from the bed is a small stage, with custom drapery that functions as a theatre curtain that can be remote-controlled to enhance the drama of her stage performances. 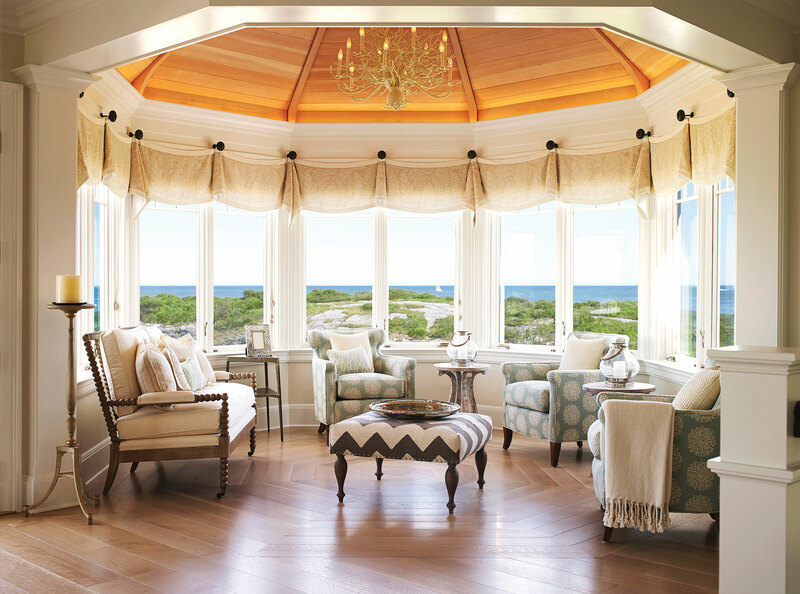 The art room sits directly below the ladies’ lounge, and is wrapped in a bay of windows facing the sea. 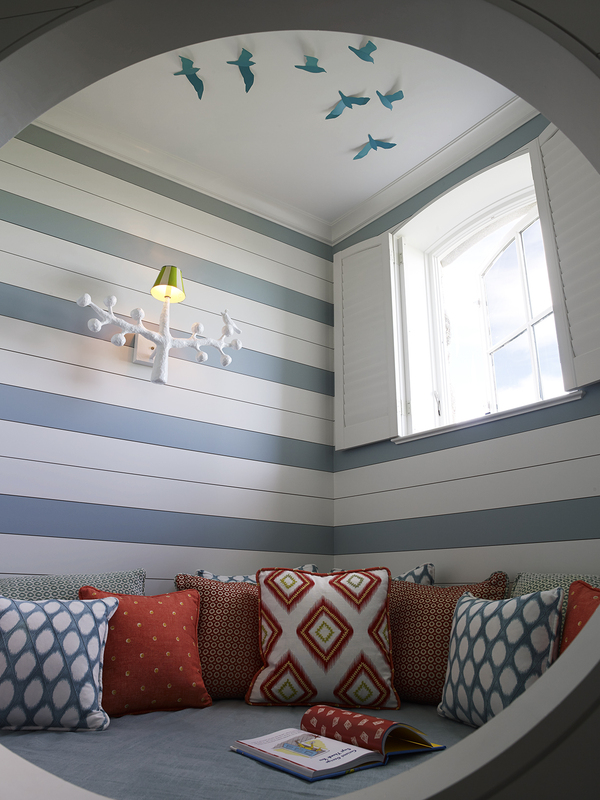 The nautical blue palette continues, with an upholstered window seat large enough to seat a small party. 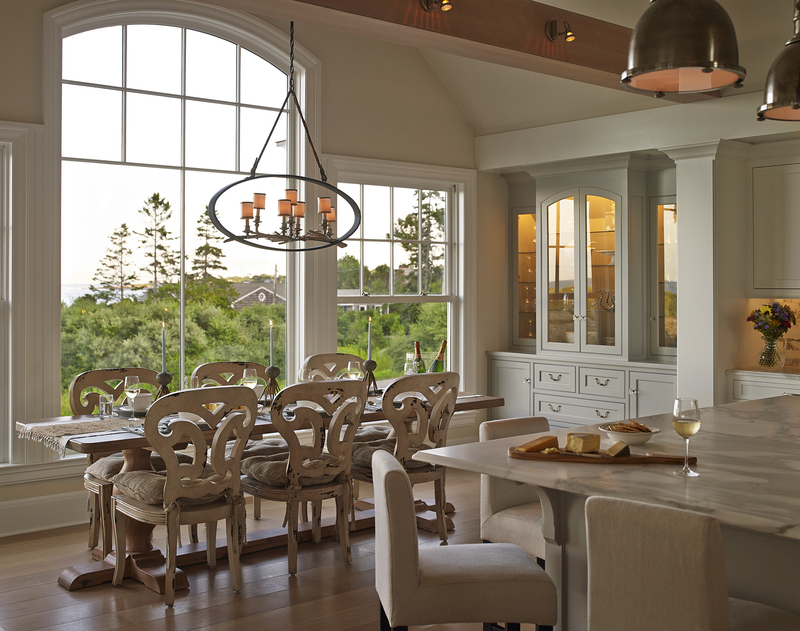 The eye-catching and one of a kind chandelier is the highlight of the room. 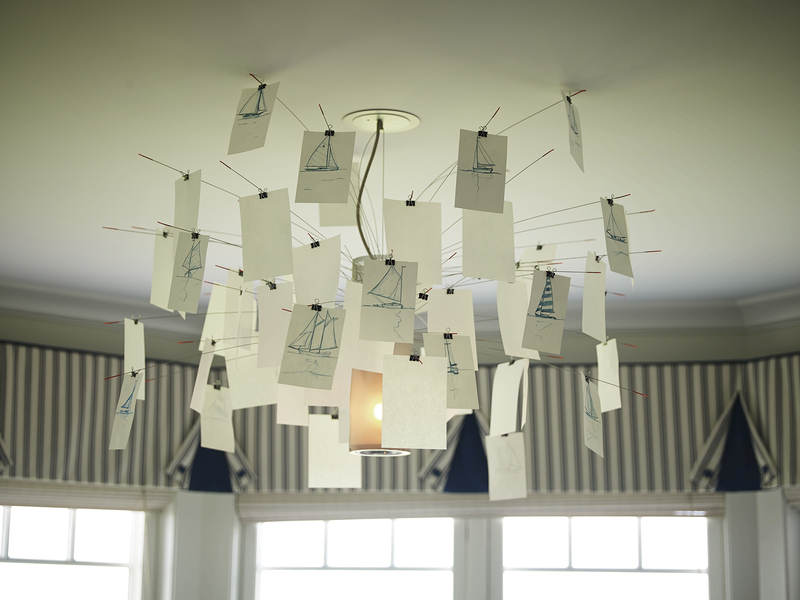 Accented with hand-painted watercolor sailboats from local Maine artist, Brad Betts, a few shades were left blank so the young resident artists can add their own touch over time.